Earlier this week, I was driving home from work, letting my mind wander and reflect. You know the feeling: you’re not really entirely present (scary while driving), but your mind is working. As I got on the 405, Pandora started playing It’s Been Awhile by Staind. It’s something I’ve heard before (don’t make fun of me) — but it’s been years. At minute 2:18 (I’ve inserted the video below for reference), I felt an angelic injection of something golden in the back of my head. It started like a tingle — and then exploded in warmth that spread to my ears (maybe a little more on the right side), then down to my shoulders, back, and torso. It evaporated somewhere around my toes, and was gone in 2-3 seconds. What on earth? The past few weeks have been a blur. Between our daughter turning one (wow, I can’t believe it has been a year), and all the incredible work our team is doing at MindFire with our multi-channel marketing automation platform, I have found little time to stop, reflect, and write. 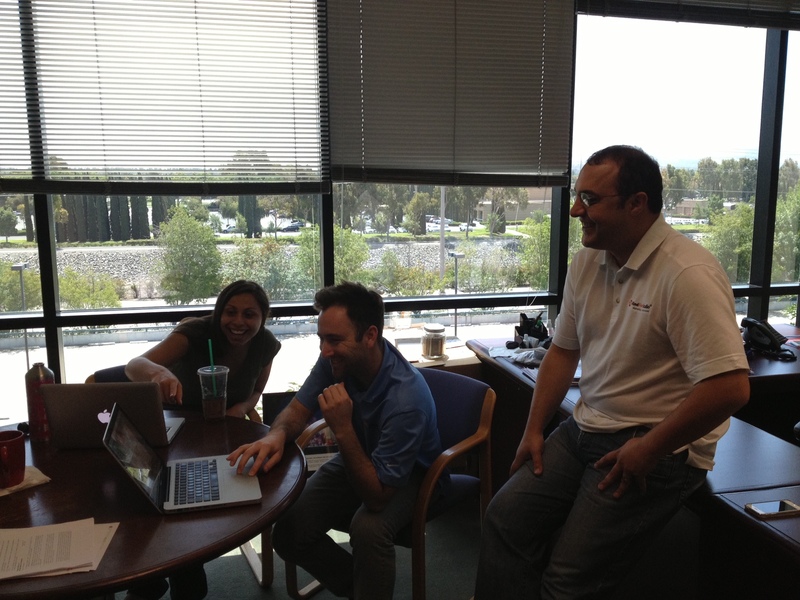 Our team enjoying a collaborative moment! Oh, and Abby also picked up herpangina — which the ER doctor reminded us had nothing to do with herpes nor vaginas, but I digress — leading to sores inside her mouth, a sore throat, and fever (she hit 106). I’m sure we have many many more of these types of illnesses ahead of us, but it led to a few difficult days and nights as she pushed through. After a few rough days, she felt well enough to play at the park near our house. 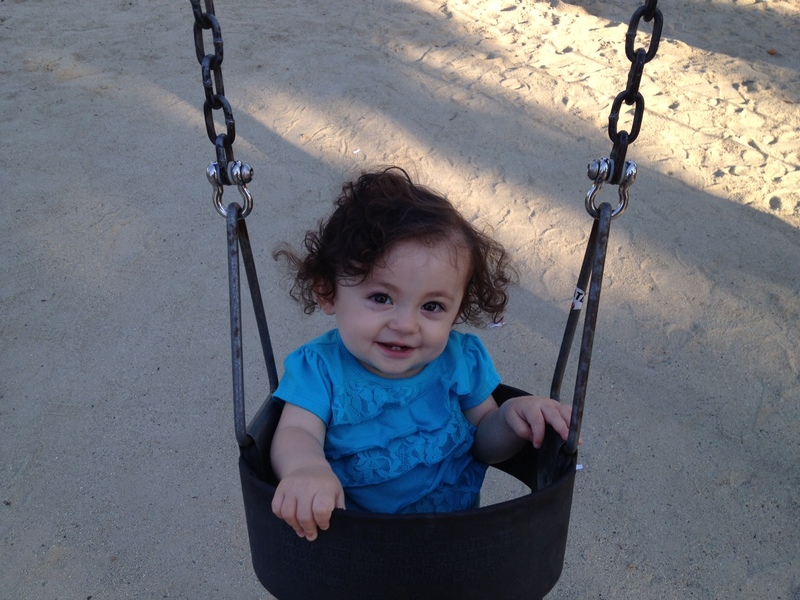 Here she is the swing starting to look like her normal self again. Our little birthday girl. Happy birthday sweetie! This weekend in the US is a holiday weekend with an extra day off on Monday, so I’m looking forward to being able to slow down, disconnect, and live in the moment. Here’s to a long weekend and time to reflect on what’s important! Every time I travel, I think of a service I’d like to have. In a nutshell, I really dislike packing. I’m not sure exactly why, but I think part of it is that I used to be so dirt poor, that I’d stress about forgetting something that I wouldn’t be able to afford at my destination. I’d worry that I’d forgotten something that would render the trip useless. Of course, I can’t recall one time these fears actually came true, but nonetheless, the packing process wreaks havoc on my OCD-impacted psyche. To ease my concerns, I’ve made a checklist of the items I usually need, along with a “best-practices” section so that I can remember lessons learned (example: waking up at 4 when a taxi is arriving at 4:30 isn’t good; wake up at 3:45 instead). Yah, I know I’m weird — but having a list seems to shave a bit of the mental anguish from the experience. Though I’ve done it dozens of times p/year and nothing really bad ever happens, I still find myself disliking the process. Ask my wife; she’ll tell you what I go through. 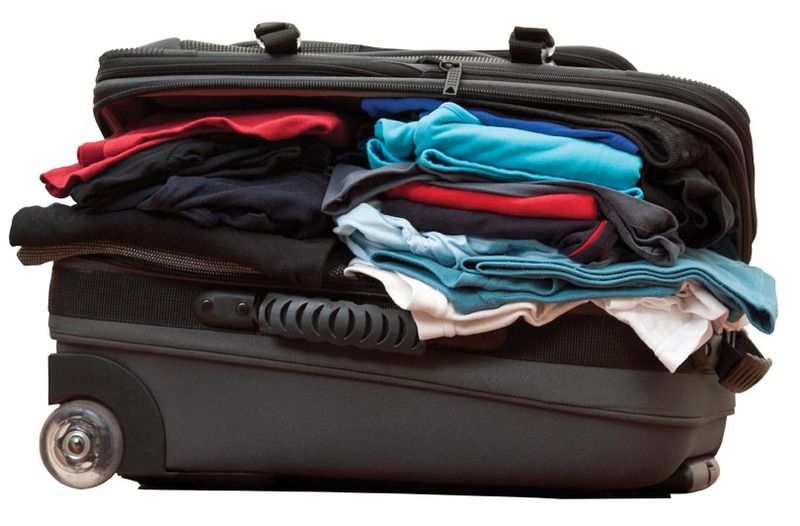 So here’s the idea: What if you could pack the ideal suitcase, and ship it to a company. Let’s call them “Travel Freely”. When you make your travel arrangements, you simply send your reservation to Travel Freely, and magically, upon arriving at the hotel, your luggage is waiting with everything you need. No waiting around at the airport. No need to pack. Just click-and-go. Opening your suitcase, you see all your favorite clothes have been cleaned, pressed, and are ready to rock. When you’re done with your trip, you check out of the hotel and they ship it back to Travel Freely, where everything gets cleaned and replenished, awaiting your next trip. Of course you’d have some options when you make your request, like the # of days you’ll be gone (so that the right number of shirts are available), or if you need any additional items packed (like extra Advil). These items would pull from a list of your favorite necessities and would be added with a few clicks or swipes on your iPhone. What do you think? Am I the only one that hates packing? Is there a service like this? Would anyone use this? Despite having jobs, nearly half of all Americans are one emergency away from ruin. My sister recently posted a comment on this post, where another reader mentioned he felt most homeless are that way because of substance abuse. 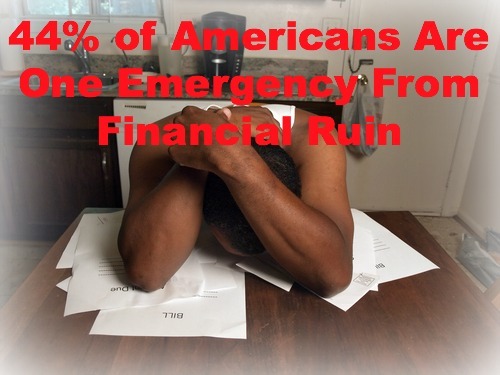 While I have not found data to substantiate this claim, I did come across an LA Times article reporting that nearly 44% of American households are one emergency away from financial ruin. As I’ve come to realize through my time with the homeless, it seems that most of the folks I meet didn’t have enough in savings to cover their basic living expenses at the time of their “event” — and according to this article, they’re not alone. Of the 44% that are one step away from the edge, most do not have savings capable of covering three months of living expenses. This means that losing a job, becoming ill, or losing their family support system can be devastating. Speaking of savings: according to a study by the Corporation for Enterprise Development, nearly a third of Americans have no savings account at all. Of households that are on the edge, about 75% are working full-time, with slightly over 15% earning a middle-class income of more than $55,000 a year. Even so, they’re one paycheck away from the edge. What do you think? Does it seem likely that nearly half of all American households are that close to the edge? If so, what can be done about this? What does it take to be present, like Abby is in this picture? 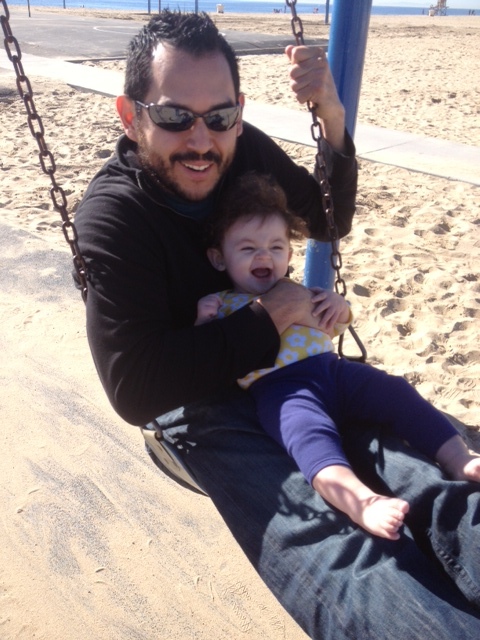 I doubt her mind was anywhere but on my lap, in that swing. Do you ever have days you just don’t feel completely present — like there’s something between you and the outside world? Or where you’re physically present, but mentally somewhere else? I’m sure you’ve got your own examples (I’d love to hear about them in the comments). So here’s the question: Why is it so hard to be fully alive in the present? Why is it that we’re often (mentally) somewhere else? 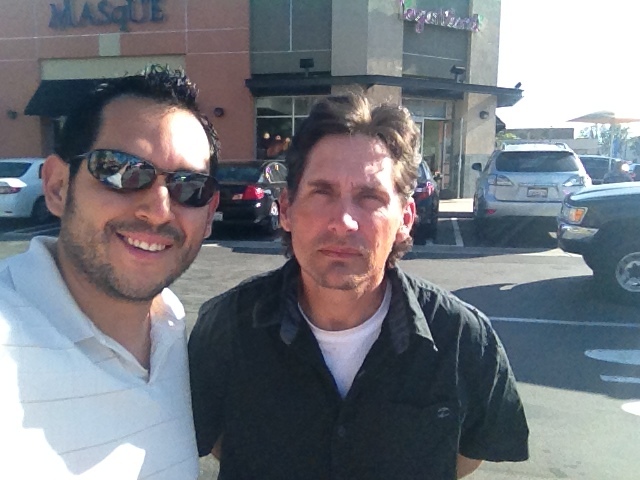 Earlier today, I met Dave for lunch at Panera, in the same shopping center as the Target we first met. I brought paperwork from the OC Rescue Mission, including a Program Agreement, Application, and Policies Handbook. He’ll review them over the next few days in preparation for his interview. Since I took a tour of the location earlier in the week, I also showed him pictures (you can see them here), which he was excited to see. His mental image was much different than what I showed him; he’s pumped! Last time we spoke, we made plans for him to read the posts I’ve written on this blog, and I wanted him to see your encouraging comments. To be honest, I was a bit nervous of what he might think as he read the posts, especially because of the pictures. As we sat eating our sandwiches, I told him that I feel he’s great about sharing his feelings, and that I wanted to follow suit by telling him that I feel a little vulnerable sharing the stories with him — but he responded positively, and was extremely encouraging. Monday of this week was a holiday here in the United States, honoring Martin Luther King. I actually forgot about the holiday until the previous Friday, so it was a nice surprise to get an extra day with the family. We started the day by making our to-do list. My wife and I are fairly task-oriented, so on days we want to get crap done, we make a list. Our list included updating our finances (we recently started using Mint.com to automate our finances, which you can read about here), writing a post about my time with Dave (homeless), who I met in a Target parking lot, and doing some work. On weekends or holidays, I love the feeling of being in the flow while I work, especially if I’ve gone for a run, had a nice shower, and eaten a good breakfast. 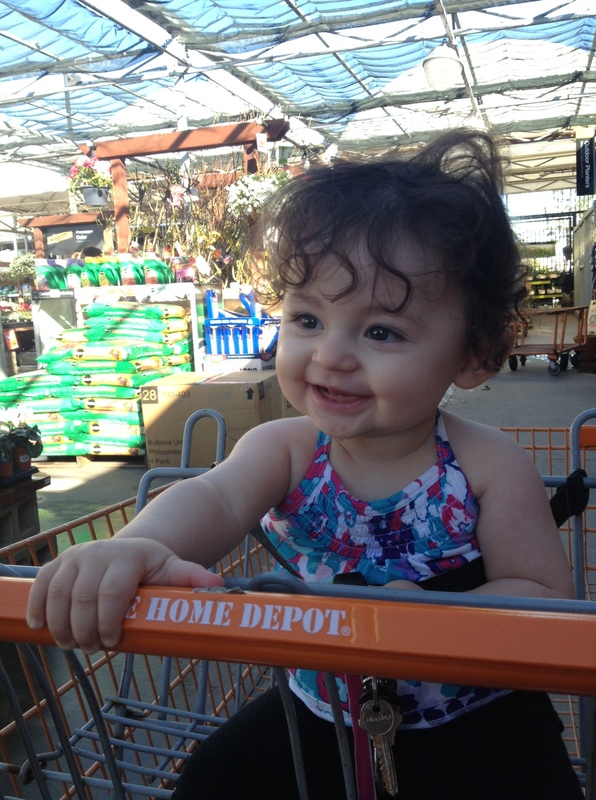 Another item on our list was to finish a home improvement project: we decided to add some stepping-stones to our front lawn, which meant making a trip to Home Depot (which also meant planning around Abby’s nap schedule). Abby loves driving her cart! This outfit killed me — so cute! Since I met “J” (who is homeless and lives under a bridge), I’ve taken to using a mental image of him to help me get over myself. Here’s what I mean: During this morning’s drive to work, I contemplated a number of issues facing us at home and at work. I’m sure you have a similar list of concerns, worries, and irritations. I suddenly realized that most (if not all) of my problems are born out of opportunity — whereas J’s problems (and those faced by billions) are existential problems. In other words, what I perceive to be problems are situations brought about by the fact that I’m blessed — not a victim. Blessing: I have a beautiful wife (and she chose to marry me); she’s also healthy! Broken apart in this way, my problem is composed of multiple blessings that bring about additional situations to consider — but unlike the problems faced by others in this world, none are life threatening. They’re merely by-products of having opportunities. Why is it so hard to remember this? I challenge you to name a problem you’re facing. Next, list the blessings your challenge is born from. Does your perspective change? Earlier today, a friend and I attended a men’s gathering at Rock Harbor. The discussion centered on how as guys, we need to foster and invest in strong relationships with a small group of other dudes. Imagine that a casket requires 6 people to carry it – 6 people who are the best of friends with the deceased. If tomorrow were your funeral, how many close friends would be carrying your casket? Really makes you stop and think. Do you have enough close (best) friends to carry your casket? Fact or Fiction: A Home Business = Freedom? For many, the idea of owning a business is synonymous with freedom, flexibility, and riches. In another post, I’ll explore this notion, as I can argue both sides of that statement: I’ve seen many business owners become consumed by their business, to the point where the business owns them. They’re miserable. But that’s for another day.